Catholic TV is an outreach of the Boston Archdiocese. You can access and watch live or archived programming including daily mass. The boys and I made our weekly trek to my parents' house today for a visit. While there, I noticed that some of their plants outside were looking rather droopy. So, I tried to help them. I plucked off their dead flowers and gave them a substantial amount of water. Pretty soon their leaves started to perk up a bit. The same thing goes for people. We often start to get droopy and discouraged. Without the water of love and encouragement, we feel disheartened. It becomes difficult to bloom in such an environment and to offer the world all that we are. Who do you know who is "drooping?" Offer a word of encouragement today and say a silent prayer for that person. Help them to bring their best to the world. Sister Jeremy speaks of the desert experience which all of us go through at some point in our lives. While we may not physically go to a desert to live, we all are tested by the dryness of life. At those times, we are “challenged, purified, to become aware of my frailty and God’s strength, of my infidelity and God’s unending faithfulness, to be healed of my enslavements and set free at the heart of my being, to learn to trust deeply in the God of promises.” The desert is not a destination, but rather a place to get through in order to reach a land of promise, as Moses and the Israelites did in the Hebrew Scriptures. The journey may be long and arduous but there is a reward on the other side. Sister Jeremy also speaks of the value of silence. Silence should not be pursued for its own sake. Indeed, there are definitely times when speech is more appropriate. Silence actually shows a reverence for speech in that it allows one to truly listen to the other. Silence is “a positive receptivity, a creative waiting, a welcoming openness. 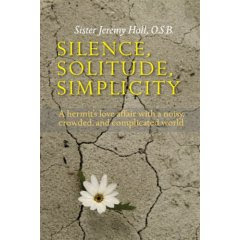 It is openness to God, to our deepest selves, to others, both as individual persons and as the human community, to beauty and truth and goodness, to mystery – and to the word of Scripture that reveals God, and to the Word who is God’s Son.” Sister Jeremy reflects on how maintaining silence forces you to actually listen to your own thoughts which at times can be an unpleasant reality. Silence forces you to listen to yourself as you truly are. It provides self-knowledge to begin working on your faults. Embracing the desert experience of silence, solitude, and simplicity helps to open ourselves to God and others. Sister Jeremy helps readers appreciate the value of the journey. I just discovered that Amazon now has non-perishable groceries on-line, including some organic/natural products. Items are also available for free shipping so it is probably the same cost of going shopping with the convenience of having the items delivered to your door. If you are interested, click through the banner below and help support this blog and the Spiritual Woman website while you shop! I couldn't believe when I came across this spot at nearby Stanley Park. I've never noticed it before. 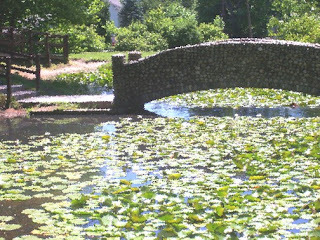 Perhaps when I have gone at other times the lily pads weren't in full effect, but here it is, my very own "Monet" type landscape, and I didn't even have to go to France! "Catholic Exchange" has a very interesting article today for single Catholics struggling to find a mate:Following Our Mother's Example Author Stephanie Wood makes the very good suggestion to pray the Rosary Novena to Our Lady to make the right decision about whom you should marry. I couldn't agree more. I did exactly that. At one point, my personal life was such a resounding mess that my best friend actually said the same novena for me as well. She didn't tell me until years later, but I am eternally grateful. And so with both novenas on my behalf, I feel confident that Bernie was the person I was supposed to marry. Ten years down the road, even with the rough spots inherent in the journey, I would do it again. That being the case, I take issue with Wood's suggestion that Mr. Right only comes in the form of Mr. Faithful Catholic. Bernie was a non-practicing Protestant when I met him. He was willing to accept my faith as part of the package, however. He knew he would spend Sunday mornings in Church and that artificial birth control would not be considered. He converted while we were engaged and has struggled with the faith ever since. I keep praying for him. At times our religious differences have made life difficult. I wish he were more invested in the Catholic Faith. But I keep praying, and God works in His time, not mine. Mr. Faithful Catholic would have been nice. Honestly, I didn't know any. I'm thankful for the man I have, and I think that he probably needed my faith and prayers more than Mr. Faithful Catholic would have anyway. God and Mary know what they are doing. For so many marvels I thank you; a wonder am I, and all your works are wonders. A first glimpse of a child usually comes in utero these days, while the child is still being “knitted together.” When I was pregnant with my first child, I remember staring at the monitor with anticipation, straining to make out body parts in the grainy image. The technician was so wonderful, pointing out arms and legs and a tiny little button nose. I was so proud of those first pictures, showing all the people I worked with, and making copies for grandparents. I still have them stored in a baby book. My swelling belly contained a child! There was a real person in there, complete with fingers and toes. He was so tiny – only a few inches in length, and yet all the parts were there. He was a real-life miracle. We are all miracles created by God, a unique manifestation of His image. When was the last time you thought of yourself in that way? We are much more likely to concentrate on all the things that are wrong with us. We tend to poke our bodies and point out their flaws. We lament the effects of gravity. We notice the wrinkles and age spots. We focus on our medical issues, the systems that don’t seem to work quite the way that they did when we were young. Yet in God’s eyes we are indeed “wonders,” the work of His hands. Think of all the things our bodies can do. Right now, I am typing this article. My fingers move in easy rhythm against the computer keys. Due to years of practice, they know exactly where to go to strike the right letter. I don’t even need to think about it anymore. Think of a young child learning to walk. She reaches up and stands and then finds the courage to let go, take a step and then land on her bottom. Yet, she is not deterred. She tries again and again until she can walk across the room. Soon, she is confident on her feet and ready to run. Most of us walk with ease. Think about the coordination of mind and body that seemingly simple action takes. Every day, we breathe, and eat, and move, and think, and feel. We also create. Witness beautiful works of art or music or literature. Are they not miracles on a smaller scale? We are able to love and be loved. We are able to show affection. We can pray. We can laugh. We can sing and dance. We can experience life in all of its ups and downs. Although I have a Master's Degree in Theology and read my Bible daily, I am by no means a Biblical scholar. One of the books of the Bible that has always mystified me is the Book of Revelation. I have always viewed it as a terrifying vision of the future. I recently read "Revelation: A Divine Message of Hope" by Father Bruce Vawter. This small book (60 pps) provided a wonderful introduction and background to the Book of Revelation. Father Vawter explains it's roots in the Old Testament and how the writer John used terms his Jewish audience would be familiar with. He also explains the symbolism of the numbers used. It was extremely informative and enlightening and made it all seem much less frightening. Father Vawter also describes the apocalyptic vision as one taking place at all times. It is both now and not yet. I would highly recommend this book for anyone who, like me, has failed to understand the Book of Revelation. It is available as a free download at : Catholic Information Service. It can also be purchased in book format for a low price. It is one of the "Veritas" series. While you are there, you might find other booklets that would interest you as well. "Do not store up treasures for yourselves on earth, where moth and woodworm destroy them and thieves can break in and steal. But store up treasures for yourselves in heaven, where neither moth nor woodworm destroys them and thieves cannot break in and steal. For wherever your treasure is, there will your heart be, too." Where does your treasure lie? I was talking to someone recently who said that they loved to work and make money. I appreciated the honesty it takes to acknowledge that, but I couldn't help feeling a little sad for the person. There is nothing wrong with making money. We all need it to live and provide for ourselves and our families; and ideally we should enjoy our work and bring our best to it. But having money-making be one's focus in life goes against the Gospel message. The things that money can buy are only temporary. We need or want them here, but the value they provide to our eternal lives is minimal. Isn't it more important to worry about our relationship with God and our love of neighbor? Searching for a religious alternative to YouTube? GodTube asks users to "broadcast Him." Religious videos from all different persuasions are featured. Catholic Daters, or Catholic Match. Interested in Spiritual Scrapbooking? Cory Richardson-Lauve has just written The Scrapbooking Journey: A Hands-on Guide to Spiritual Discovery which offers eight projects to help scrapbookers "go deeper with this latest form of creative journaling." The Gospel readings the past few days have been from the Sermon on the Mount which is full of instructions that go against what you would usually expect. Today's reading is no exception. I can handle praying for my enemies. Loving them is something I still need to work on. That is the beauty of the Gospel message, though - there is always room for us to improve! I have had a pair of sandals that I loved for the past three years. I bought them at Target for $12 and they were so comfortable and perfect with casual or dressy outfits. I wore them everywhere in the summer months. By year number 2 with these sandals, they were beginning to wear out and I went back to Target to see if I could find another pair. There was none to be found. I found another pair at a clearance outlet - name brand reduced from $60 to $10 - a bargain in every sense of the word. They were comfortable but I couldn't get past the fact that these were $60 shoes. I have never owned a pair of $60 shoes in my life! So, I couldn't get comfortable in them. I saved them for dressy occasions and wore my old favorites for everything else. Fast-forward to year number 3. By this point the sandals are literally falling apart. They are torn on the bottom right through the sole. The sides are held together by loose threads. Not only that but they have begun to smell and even Febreeze hasn't been able to save them. Finally, my husband told me the sandals had to go. At first I protested. "They are my favorite shoes!" As I thought about it, though, I realized that he was right. I had become overly attached to a material item. What I had considered a virtue (my frugality) was actually a liability (my over-attachment). Material items are good. We all need them. But by the same token, we should be able to take or leave them. So, this morning, the sandals hit the trash bin. I am now wearing the sandals I bought last year. I'm not offering any guarantees that I won't still be wearing them 3 years from now! Is there Something Wrong with Our Eyes? Now that the lushness of summer greenery is upon us, does this ever happen to you? You sit on a deck or by a river with a view that seems picture-perfect and pleasing to your soul--until you see the ugly factory or huge power lines right splat in the middle of it, and feel irritation instead of pleasure? Years ago when my in-laws lived right across the Connecticut River from Mt. Wantastiquet in Brattleboro, VT, that was a common occurrence. The view from their dining room would have been amazing had not the dozens of telephone poles lining the river limited anyone's use of the term "breathtaking." My father-in- law, however, was not "anyone." Every time a new visitor said something along the lines of, "What a beautiful view you have. What a shame the phone poles mess it up," he would comment, "What is it with us? Why do we always notice the one thing that may be "wrong" instead of the many things that are definitely right?" Now my in-laws are dead, and I don't live by a river or have lines of telephone poles to worry about. But, until yesterday, every time I sat on my deck, the ugly dead branch hanging like a skeleton just to my left really annoyed me. And, until yesterday, whenever I sat in my rocker looking out our front window, the huge dead tree spreading its tentacle-like branches across the green landscape inevitably attracted both my eye and my disappointment. Perhaps my father-in-law's spirit paid me a visit, I don't know. But all of a sudden it occurred to me I could choose to look elsewhere. I could choose to look at the amazing fir tree and delightfully shaking aspens by our deck and just skip looking left at the ugliness. Similarly I could focus in on the many flowering bushes in front of my house --and never even see the dead tree! Okay, so I don't have this new behavior mastered yet, but it's become a new point of awareness. Each time my eyes race to the dead branch or ugly tree, I have another chance to consider to my father-in-law's question: why do we get annoyed by a few minor "negatives," when there is so much that's positive we could focus in on instead? Let me know if this approach works magic for you too. The two women were distant acquaintances brought together by the one empty table in the small eatery. Over this chance meeting, they quickly got re-acquainted, and began discussing life. By the end of the ten-minute conversation, one left with the other’s phone number and an agreement to take her to her Evangelical church the following Sunday. Sitting at the next table, I couldn’t help but be amazed at this interchange. I had just witnessed evangelization in action. One woman was looking for something in her life and the other had the answer. She spoke in glowing terms about her faith community and how welcoming they were. She told of Bible studies and women’s groups and shared breakfasts. I admired her enthusiasm and her commitment to spreading her faith. Would I have done the same? Sadly, I would have to say “No.” We are called to evangelize. In Matthew, Jesus tells us; “Go, therefore, make disciples of all nations; baptize them in the name of the Father and of the Son and of the Holy Spirit, and teach them to observe all the commands I gave you.” Perhaps it is because of a legacy of anti-Catholic sentiment in the United States, but Catholics are much more likely to keep quiet about their faith. I know that I am. I might reach out to a lapsed Catholic and invite them to come back to Church. I am happy to discuss my faith with anyone who asks; but, I would never have the courage to do what that woman did and invite a near stranger to come worship with me. I probably never would have brought my religion up in conversation. Chris Klicka, Senior Counsel for the Home School Legal Defense Association, recently penned an article on “Homeschooling and Evangelization.” He offered a step-by-step plan for how to bring up religion in casual conversation and why it is so important to do so. “We need to come to the realization that life is too short and hell is too long for us to delay. Every moment we delay, more souls fall. It is an intense spiritual battle, which we cannot physically see, but it is raging all around is. God uses us to bring the message of salvation to lost souls.” Klicka suggests always having printed religious material available to share with anyone you might talk to. He recommends finding common ground and gently steering the conversation toward the faith, including asking people if they are Christian, and then following that up by asking if they are “born-again” Christians. While I disagree with some of his theology, one cannot deny that he, and Evangelicals like him, take very seriously the mission to make disciples wherever they might be. Perhaps there is something we can learn from our fellow Christians about having enthusiasm for our faith and sharing the good news. We can be the Catholic Church’s best marketing materials by speaking about our faith openly and honestly and by sharing the good things that go on in our parishes instead of grumbling about the bad. St. Francis said that we “should preach always. When necessary, use words.” We can follow his advice and live joyful Christian lives that will attract people to our faith. When they ask, we can use our words to explain the reason for our joy and peace. We can invite someone to come worship with us. We can allow God to use us to help bring people to Him. In the event that any of you have children who love Thomas trains as much as mine do, be aware that there has been a significant recall of trains made after 2005 due to a lead paint issue, primarily with red paint. "Now this Lord is the Spirit and where the Spirit of the Lord is, there is freedom." We often think of freedom as being able to do whatever we want to when we want to. While that is certainly one definition of freedom, that is not a freedom that will bring us peace or happiness. We have rules in society in order that all can co-exist peacefully. We willingly relinquish some of our freedom in order to be able to leave safe lives. God sets up rules for us as well to help us lead good lives in the Spirit. By living lives rooted in love of God and love of neighbor; by following the Ten Commandments, we can obtain true freedom. Yes, sometimes it is hard. It can be easier to do the wrong thing rather than to go against the crowd and do what is right. It can be easier to give into temptation and do what "feels good" instead of what God tells us to do. Yes, we have free will and we can make those choices, but those choices won't set us free in the ways that matter. It is much easier to follow the Lord and make the right decisions and go to sleep with a clear conscience than it is to do the wrong thing and have to rationalize our actions and live with our guilt. Never think as lost the time that you spend in prayer. You will see that in prayer God will communicate to you the light, the strength, and the grace that you need to do all that He requires of you. The only important thing for us is to do the will of God, to be where He wants us to be and to do what He expects of us, always with a spirit of humility, conscious of the fact that we ourselves are nothing and that it is God who works through us and makes use of us to accomplish His work. Therefore we all need to intensify our life of union with God, and this can be achieved only by means of prayer. Let time be lacking to us for everything else but never for prayer and you will experience the fact that after prayer you will accomplish a lot in a short period of time. I can vouch for that last statement in my own life. If my prayers haven't been said I am much less productive, as well as much less patient and understanding. Prayer helps my whole day go much better. As the old adage says, "I had so much to do, I had to take time to pray"
So technically, it isn't summer yet, but for those of us in the Northern Hemisphere, these few days provide the greatest amount of daylight hours in the whole year. It's beautiful! People just feel better when the sun is shining. The sun gently wakes you in the morning (granted sometimes a little early!) and stays out until after 8 pm. Tonight, after my boys were in bed, I went outside and sat out on the front stoop with my husband for a little while. We just sat there and read and listened to the birds chirping. It was wonderful. Don't let these days of summer pass you by. Get out and enjoy them. Sit out and relax. Embrace summer! I love thunderstorms. The sweet smell and feel of rain after a hot, dry summer day is so refreshing. Nature’s fireworks in the sky are beautiful to me. But I know that they can be scary, too. My grandmother used to hide in the bathroom whenever the rumbling would start! My children aren’t fond of the storms, either. Tonight as a storm raged at bedtime, they didn’t want to go to sleep. I assured them that I would sit in their room with them. To help keep them from being afraid, I told them to think about God and the angels bowling up in heaven, making all the noise. I know that is obviously not the case. They do, too, but it seemed to provide some comfort and gave them something to think about as they drifted off to dreamland. It also got me thinking about what heaven might be like. We know heaven exists and that it will be a place of perfect happiness. We know we will be united with God and with the loved ones who have gone before us. Yet, so much is mystery. What will we do there? My children often ask if their toys will be in heaven. I tell them that in heaven they will have all that they need and desire. I wonder also if there are toys in heaven for the children who are there. My family has often joked that my grandparents and great-aunts and uncles are all up in heaven playing cards, their favorite pastime here on earth. I wonder. I would like there to be libraries and art museums in heaven. I would like there to be beautiful fields and flowers. I know that heaven will far exceed any visions that my imagination might create, and I can only hope to one day have the opportunity to experience it. For the moment, it is clouded in mystery. We don’t like mystery. We like to understand things. We like clear-cut processes and directions that make sense. We like to be able to find the answers to our questions. This isn’t how it works with faith or with God. We catch a glimmer and that glimmer sustains us. We hope for a future in which it will all be clear. In the meantime, we can learn to embrace the mystery. We can experience awe in the presence of a God who is so powerful that we cannot even begin to fathom the depths of His existence. We can be thankful for the opportunity we have to be a part of God’s incredible creation. My mother used to tell me that we would get our answers in heaven to all the questions that haunt us here. I hope so. Who knows? Maybe we will even see the angels up there bowling. It is not wrong to want to live better; what is wrong is a style of life which is presumed to be better when it is directed toward "having" rather than "being" and which wants to have more not in order to be more, but in order to spend life in enjoyment as an end in itself. It is therefore necessary to create lifestyles in which the quest for truth, beauty, goodness and communion with others for the sake of common growth are the factors which determine consumer choices, savings, and investments. This was something I read about on Lisa Hendey's blog and it seemed like such a good idea that I thought I would mention it here. Good Deed Beads are beautiful beads that you can wear as a bracelet to help you remember to make small sacrifices throughout the day and offer them to God. Sacrifice is so downplayed in this world, yet is so valuable for our spiritual life. Isaac is growing up, too! Not only is David reaching the big milestone of starting 1st grade, but Isaac is growing up as well. There is something about being 4 which makes little children leave a lot of their babyness behind. I saw it with David as well. All of a sudden, he was ready to take on the world. Isaac has reached that stage. 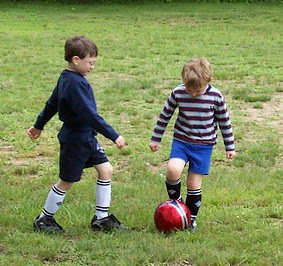 The boy who has been literally attached to my side for the past two years is so excited about going to school next year and decided to start playing soccer this week. David's coach had said he could play, but he had no interest. This week, I asked him if he wanted to play. He said, "OK, maybe I will." And he was great. He knows how to play from watching David and he got right in there and was kicking the ball and waving his arms saying "I'm open! I'm open!" He's going to play in the game on Saturday. I know my boys still need me, but it really feels like I'm entering a whole new phase of my parenting journey. This always seems to happen - I get comfortable and feel like I know what I am doing with caring for my children and what to expect from them, and boom! they keep growing and the rules seem to change! Life and parenting are full of surprises! David had his Kindergarten completion ceremony this morning. 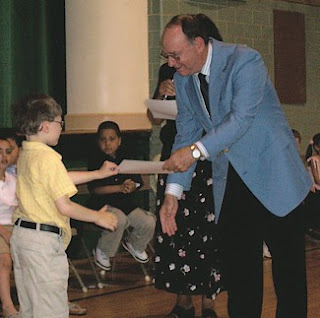 That is he in the picture receiving his certificate (yes, with his shirt hanging out. I swear it was tucked in at the start of the affair!). The ceremony was great. The kids sang songs and talked about their favorite memory during the year. David's was making paint. Their 8th grade big buddies also stood up with them and said something nice about their little buddy. I really thought I'd end up bawling like a baby, but I only teared up a little bit. It is bittersweet, though. One more milestone on the way to growing up. This year has been so hard in so many ways, and yet, now that it is done, I feel like it was worth it. As many of you know, I have struggled with the whole homeschool vs. school decision. I think that I am really a homeschooler at heart, and I am so looking forward to the next three months to relax and learn with my boys. At the same time, I appreciate the structure of the Catholic school. David seems to really need that in his life to help him focus. While he learns many things with me, I think that he really needs someone else telling him he needs to do things like spelling and handwriting practice. Then, he is willing to come home and work with me on it. I also love the sense of community at the school. The parents of the children are friends. David has made some wonderful friends this year as well. I love the religious atmosphere - the fact that God and Catholic living are at the heart of all that they do. I value that from my own Catholic school experience and I am glad that my boys are getting that experience as well, reinforcing the faith that I teach them at home. I guess I hope that I can combine the benefits of both traditional education and homeschooling, even if it is primarily during the summers. I want my children to know that sometimes they have to learn things that they don't want to and follow rules. At the same time, I want them to love learning. I want them to know that learning doesn't only take place in school - that the whole world is a classroom. I want them to be passionate about learning and follow their interests. I want them to question and search for the answers. I want them to have time to dream and imagine and play and discover who they are. So, that is what this summer, and hopefully, all the summers to come, will be about. I got into a bit of a cleaning spurt today. In the closet in our master bedroom are several large plastic containers filled with items that really haven't seen the light of day since we moved 2 1/2 years ago. They were taking up room in the closet and serving no real useful purpose. I decided it was time to do something about it. A couple of the boxes were full of clothes. I sorted through them, throwing away items that were ruined beyond repair (why exactly had I packed those in the first place? ), keeping a few select items, and putting everything that no longer fits into a bag for Goodwill. At this point, I feel it is time to accept that my stomach will never be quite as flat as it was before I had children. One of the boxes had office supplies. Those I took out and put in my husband's office. Another box was full of family photos. While most are dated at this point, I took out the frames. Another day, I will remove some of the photos are replace them with new photos in need of homes. Some of the boxes simply had to stay. There is no other place to store my wedding memorabilia and I am not ready to part with it yet. I figure some day my kids will get a kick out of looking at it. Another box holds a few old school papers and my and my husband's diplomas. In any event, I did manage to clear out five boxes and make some space in our closet. Of course, what else can you do with empty containers but fill them with more stuff! After my six-year old son David got out of school today, I had him help me go through all of his papers and projects from the year to see what we should keep and what we should throw away or recycle. The volume of paper a kindergartener creates in a year is truly amazing. I tried to impress upon him that we didn't need to keep every paper, but many he had an emotional attachment to. He isn't ready yet to let go, which I do understand. He worked hard on those papers and it is hard to throw away your work. We probably cut the volume in half, which at least is now stored in a plastic box which can go in the basement instead of overflowing a bureau drawer. I know that in time he will be ready to part with the bulk of his papers. When he is 15 I doubt he will care about his coloring papers from Kindergarten. Then, he will be ready to let go. I’m currently reading “The Intimate Life of Sister Lucia” by Father Robert J. Fox (Fatima Family Apostalate, 2001). Sister Lucia was the oldest of the three children who saw Mary at Fatima. She passed away in 2005 at the age of 97. The five-year time period has not yet passed before a formal process into her canonization can begin, yet there are few who would dispute her holiness. The title of Chapter 8, “No One is Born a Saint,” struck me. How true are those words! None of us are born saints. We are born with all of our human weakness. Yet, each of us is born with the potential to be saints. Our sole purpose in life is to ultimately be joined with God in heaven. Thomas Merton once remarked that to become a saint, one must want to be one. It must be the goal of our existence. Yet we often don’t see life in those terms. When asked, “What do you want to be?” we are likely to answer in more earthly terms. We might want to be a good parent or successful in our work. There is certainly nothing wrong with those goals, but they don’t take into account the larger picture. This life is temporary. If we are lucky, we might have 100 years to make our mark on the world. Eternal life is just that, eternal. We might also think that sanctity is for other people. Priests and nuns might be called to be saints, but surely not us. Nothing could be further from the truth. Vatican II debunked the idea that there were two paths to holiness once and for all. There isn’t one road for those who have committed themselves to religious life and another for the rest of us. We can be holy living our own vocation, whatever that may be. We can be holy changing diapers or working in a factory or managing an office. We can offer our lives as a prayer; we can sacrifice; we can listen for God in the stillness. We are called to pray and serve God right where we are. We are called to follow the commandments and to do the right thing even when it is hard. We are called to work on our faults and to seek God’s forgiveness when we fail. We are called to love God and neighbor. We are called to serve. We are called to be as holy as we can be. We may never be canonized, but we are called to be saints.